The origins where my field-related internship in the fifth semester, which I did in the winter 2014/15 at the Ägyptische Museum Berlin (Egyptian Museum of Berlin). This internship is integral part of the Museumskunde (museum studies) course plan to graduate as a bachelor at the Hochschule für Technik und Wirtschaft Berlin (university of applied sciences in technology and economy). During this time I learned how audits are done by the staff at the Egyptian Museum. During my studies I already realized how much fun I had working with a database and in a museum storage area and that’s probably why the audit suited me especially fine. I helped taking photos and measurements as well as cross-checking data with the old paperwork. While I did some research for my internship report I realized that there was no recent literature on this topic. 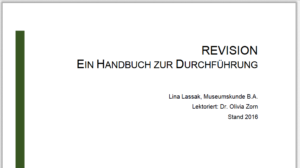 So the topic of my bachelor thesis was set. While I researched for my thesis I continued helping with the audit at the Ägyptische Museum and found two guidelines for the process: There was Hans-H. Clemens: “Inventur im Museum. Rekonstruktion und Modernisierung traditioneller Sammlungsverwaltung – ein Praxisleitfaden” (Inventory in the museum. Reconstruction and modernisation of traditional collections management – a guideline for the practice) and then there was “Spectrum 3.1 Sonderheft 5″ (Spectrum 3.1 Special Issue 5” by the Institut für Museumsforschung der Staatlichen Museen zu Berlin – Preußischer Kulturbesitz (Institute for Museum Research of the Berlin State Museums – Prussian Cultural Heritage Foundation). But the first one is a bit outdated because it barely mentions digitization and the second just describes the process. What I also discovered was that there was a whole bunch of different terms for the same process and that nearly every state in Germany had some kind of directive for audits in place, but staffers didn’t know exactly how to put it into practice. After graduating as a bachelor both supervisors of my thesis, Prof. Dr. Kähler and Dr. Zorn, suggested to develop a handbook out of it. That is what I did in the past year, supported by Dr. Zorn, and now I was able to publish it on Zenodo. This handbook is no directive on how to do a proper audit, but a basic guide that helps to develop a handbook for the own audition project, tailored to the needs of each individual collection, as well as for the actual audit. That’s why it doesn’t focus only on archaeological objects but also includes examples of other artifacts. MuseumPlus is used as the example for the Collections Management System, but the data fields should be easy to transfer to every other system. The Ägyptische Museum is used as a detailed example because that’s where my experience comes from and because the colleagues there have developed and modified their own handbook for years. The steps can be transferred to all kinds of collections. I am trying to provide some assistance and help feeling confident when using a software.